When you hear “milk chocolate”, what colour comes to mind? In our efforts to support a recent promotional program for Hershey, Design 1st had some chocolate colour co-ordination to sort out. The program involved a pickup truck fully wrapped in printed vinyl, a giant painted fiberglass chocolate bar structure, and backpacks sewn with custom-printed fabric. Before Design 1st was brought on board the project, Hershey’s mobile marketing firm, Gearwerx had been busy developing print graphics for everything from billboards to chocolate bar wrappers. The Design 1st challenge was to first get agreement across the stakeholders as to what particular shade of brown was the right one, then ensure that the selected colour could be matched across the printed and painted materials. Start this process as early in the program as possible, especially when it’s only a matter of weeks from start to finish. Colour can be an emotional and highly subjective topic across the design and client teams, and colour-matching of the specified and sampled colour rarely gets done correctly the first time. Colour is a manufactured item, so it has tolerances that are technical, using the CIE L*a*b* Scale, but the visual evaluation of colour matching should also accommodate some tolerance. The project team was looking for a cohesive look of CMYK-printed vinyl and fabric from different suppliers, with a high-gloss paint. The differences in gloss and texture showed a visible variation, but the hue, value, and chroma of the chocolate browns worked together for a great overall image. To specify and communicate colour visually, there are colour standards that are widely used and available, Pantone (www.pantone.com) being probably the most popular for printed colour, and RAL (www.ralcolor.com), which has a long history, initially started to serve the European paint industry. Once there is agreement on colour(s), it takes time and effort to get sample colour swatches prepared, especially for textile, or for custom paint matching (if it’s required). The print supplier may have to recalibrate their printers’ colour profile a few times to get the Pantone specified artwork to match the actual Pantone colour swatch. 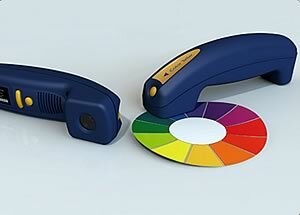 For paint, each manufacturer will have a swatch chart of colours available, and often some of them will be cross-referenced to the RAL or Pantone standard. If you can specify a colour from the supplier’s chart, then the expense, time, and risk of mismatch of a custom colour match will be avoided. For Design 1st during “getting the colour of chocolate right…fast, there were some learnings. For the chocolate coloured paint that was applied to the fiberglass structure, backpack chocolate bars, and four large coolers, a good match was completed, but the supplier did not have the material in stock to prepare the quantity of paint required. This was discovered late on a Friday, so new stock was at least three days away. Don’t expect a delivery or courier service to carry paint, as it is classified as a hazardous material. An alternative local supplier of the same paint/colour system was located, but a sample of the same paint spec turned out differently. For Hershey, visual approval by the clients was required (and is usually the case), and for the chocolate colour there were parties in Montreal and Toronto to send samples to for sign-off. Fortunately the colour mismatch was minor enough to be approved, but this experience reinforces the suggestion to get the colour program going early in the project. OK. Now you can think about the taste of “milk chocolate”, which is where you really wanted to go anyway, right? Drop by Design 1st for your free Hershey chocolate sample and talk to us about your next project. You can reach us at 1.877.235.1004 or .